What is a boat bill of sale? It is a legal agreement between yourself and the party you wish to do your boat transaction with. These forms do assume the boat is in used condition and therefore being sold in AS IS condition. Simply open the bill of sale PDF form, fill in the necessary fields, and print two copies of the form, then have both parties sign. 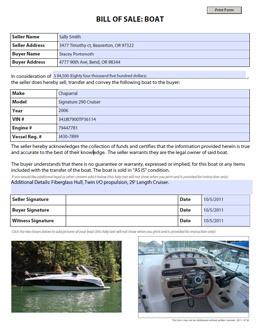 Additionally note that these free bill of sale templates offer the ability to add two pictures representing the vehicle involved in the watercraft transaction. Below we layout a couple simple steps to create your boat bill of sale. 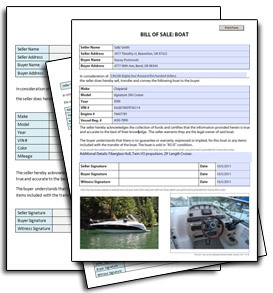 In step one download the bill of sale pdf, in step two complete the form field entry, then finally print by clicking the button on the top right of the watercraft bill of sale. Please be patient while downloading the boat bill of sale forms as the file sizes may cause it to take a moment depending on your connection speeds. 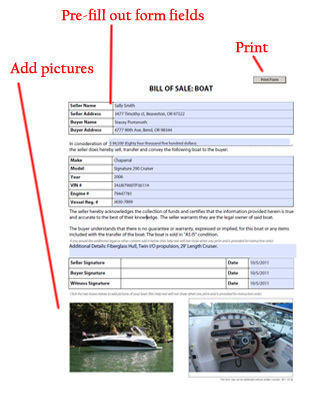 Once you have successfully opened your boat bill of sale form into an Adobe Reader software product, you can begin filling all the form elements shown in light blue to the right. Also notice that beyond all the basic form fields, you have a field just above the signature area that allows you to add optional text if there is something about this bill of sale agreement that you would like to add. As a final step you can optionally add two pictures of the boat at the bottom of the page. When complete, click the print button on the top right of the form. Remember to print at least two coppies. Note: Remember that you can't save changes unless you have a premium PDF editor. However, this is a printable bill of sale form. Therefore remember to print all necessary copies, otherwise the form will be blank when you open it up a second time. Step 3 - Tell Someone! If you appreciated our templates, take a moment and create a link on your blog, website, Pinterest, or anywhere else you can think of! It is a simple way to say thanks for this free service - but is entirely optional of course! Click here for link instructions. Making life a little easier with our free Bill of Sale Templates!